Olivia has become enchanted with red velvet cake. It all began with a simple, spectacular cupcake. A local coffee shop has an in house baker, a fabulous creative baker. She makes these divine cupcakes of all flavors. Months ago I stopped in bought a four pack and brought them home. We were celebrating something but I have since forgotten what, all that is remembered are those amazing cupcakes. Each cupcake is decorated simply. It's piled high with frosting and then depending on the flavor sprinkles might be added or a small cookie or even a piece of candy will top it. Some have fillings as well, like the strawberry cupcake, which was a refreshing burst of strawberry goodness. What is so absolutely wonderful about these cupcakes besides looking so perfect is that they are perfectly balanced with sweetness. It's not overwhelmingly sweet so you feel pleasantly pleased with the dessert. One of the flavors I brought home was red velvet. Olivia was suspicious at first, never had she seen such a thing as a red cake, but Daddy can be very persuasive when it comes to treats. His encouragement has resulted in a new fascination. Since she now LOVES red velvet cake she requested it for her birthday. For years I have had a red velvet cake recipe, never once did I make it, the recipe lingered in my box awaiting the perfect moment. I must say it was rather foolish of me to keep this gem hidden for so long. I wish I could tell you where I found this recipe or who can be credited for it but as often the case we find fantastic things and neglect to keep track of those details. With that said this recipe came from somewhere created by someone. Preheat oven to 350 F. Place paper cupcake liners into muffin pans. In a medium bowl, combine cake flour, cocoa and salt, whisk thoroughly and set aside. In the bowl of an electric mixer combine oil and sugar. Beat at medium speed until well-blended. Beat in eggs one at a time. Reduce speed to low add red food coloring slowly, without splashing. Add vanilla. Add flour mixture alternately with buttermilk in two batches. Scrape down bowl and beat just long enough to combine. In a small dish, place the baking soda, stir in vinegar and add to batter with machine running. Beat for 10 seconds. Divide batter among cupcake compartments, filling about 2/3 full. Place in oven and bake until a cake tester comes out clean, 20 to 25 minutes. Let cool in pans 20 minutes. Then remove from pans. Let cool completely before frosting. Yield: 24-36 cupcakes depending on the size of pans. *This recipe will also yield three 9-inch layers. Make sure you butter the cake pans well, then line the bottoms with parchment paper. Bake longer (40-45 minutes) when making a layer cake. Place cream in bowl add a few tablespoons of the sifted confectioner's sugar and whip cream until soft peaks form. (I find that if you chill a bowl and beaters in the fridge before beating the cream comes together quite well.) Cover in bowl and refrigerate. In a large bowl blend cream cheese and mascarpone with electric mixer until smooth. Add vanilla and confectioners’ sugar. Blend well, scraping down sides. Fold in whipped cream. Pile high on cupcakes with a knife or through a pastry bag. Yield: 36 small, 24 large cupcakes or the tops and sides of a three-layer cake. Do note that red velvet cakes are known for bleeding into the frosting. If you make this cake in advance I suggest waiting to frost on the day you serve it. Also I dare you resist this frosting, because if you are like me, it'll be "just one more taste...."
THANK YOU! 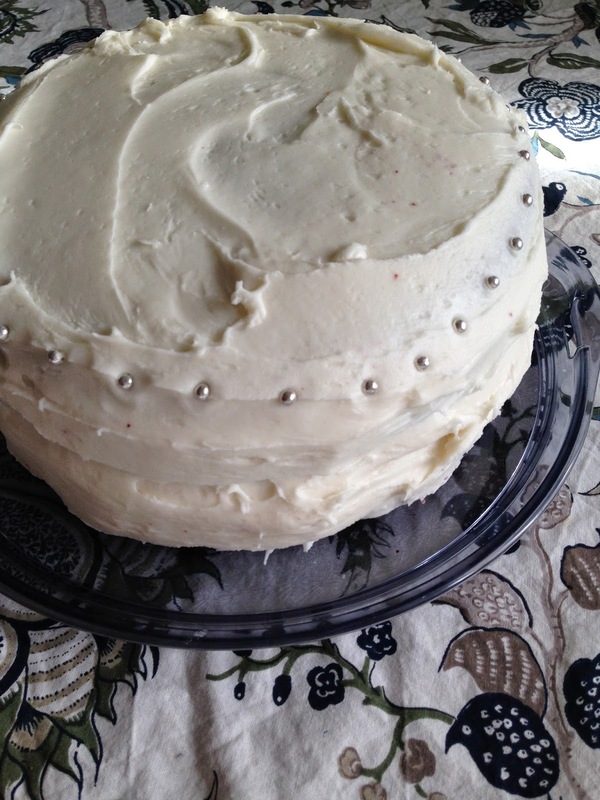 Thank you for going with a real red velvet cake recipe with scary things like buttermilk and vinegar (not that you yourself are scared by such things, but I know plenty of people who are)! Red velvet cake is my favorite thing ever. I ask for one on my birthday every year, but it has to be homemade because NO ONE sells a worthy version, not even my favorite cup cake shop or the wonderful bakery that made our wedding cake. If it is not really red, if it's brownish, it's not red velvet cake. (Or Jackie O. Cake, as it's known to some.) And it's not a chocolate cake; I hate when people say, "Oh, it's red but it's a chocolate cake." It's so much better than that! Aunt Eileen has made Red Velvet cake for as along as I can remember. That's about 40 years or more in people time. She gave me the recipe along time ago but unfortunately I never made one. The recipe you have here looks familiar so it might be the same one. There's nothing better than Aunt Eileen's Red Velvet cake and her famous mashed potatoes. I made a red velvet cake last weekend with this recipe http://www.howcast.com/videos/139827-How-To-Make-Red-Velvet-Cake and it tasted delicious!! Going to try cup cakes next time.